Over a month after Manjit Singh won gold in the Asian Games men's 800 metres, the middle-distance runner is yet to receive a job or an inclusion in the Target Olympic Podium Scheme, casting a shadow over his preparations for the 2020 Olympics. 'I have applied for the TOP scheme and the Haryana government has said that they're working on it, but I haven't received any news from them. Since there are so many athletes competing out of Haryana, it's tough for them to find me a job. 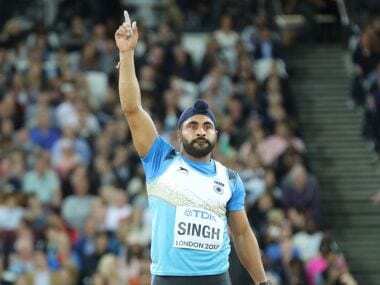 I would prefer it to be wrapped up as soon as possible, so I can focus on my preparations for the upcoming competitions that will help me qualify for the Olympics," Singh told reporters at the sidelines of an event in Mumbai. Singh has been unemployed for two years now and lost his job at ONGC in March 2016, after failing to provide satisfactory results and being deemed too old to improve. Since then, the runner from the village of Ujhana has had to struggle to make ends meet while simultaneously training for the Asian Games. "I don't have a job at the moment, and I put some of my own money into training for the Asian Games. I was training at the camp in high-altitude conditions in Bhutan, which helped me win the gold. I'm hoping to train in a similar set-up for the Asian Athletics Championships, but it won't be possible without some sort of financial backing and the support of the federation," said Singh. The lack of a sponsor has further compounded Singh's troubles, as it prevents him from training abroad and improving his form. "Training abroad in a place with great facilities is not something I can do right now. I'm unemployed, but even if I were to get a job within a few months, I would not be able to afford it on my own. I need a sponsor for that." A long period of training away from home before the Asian Games also took its toll on Manjit Singh, who was unable to meet his newborn son. "The target for the last two years was the Asian Games. I made sure to avoid any disturbance in my routine, even if it meant that I couldn't go and see my family. When my son was born, my family asked me to come home for a week, but I said no. I knew that if I took just one week off, it would set me back by a month. It felt great to finally go home and see him," said Singh. Like his compatriot Jinson Johson, who he beat in the 800 metres, Singh has also decided to focus extensively on one distance in the build-up to the Olympics, instead of participating in both the 800 metres and 1500 metres, saying, "Johnson and I have both been competing in two events, but I know that my preferred event is the 800 metres. I also know that Johnson is much better than I am in the 1500 metres, so it makes sense for me to take a step back." "Every athlete has their own strengths and they should know when to stick to what they do best," he added before signing off.